Each year a committee of faculty and students undertakes the difficult task of choosing the best journal articles from the many high-quality papers written by VIMS graduate students. Each paper considered is either accepted, in press, or published in a high-quality, peer-reviewed journal. The papers reflect the superb quality of the research conducted by VIMS students and the outstanding mentoring of their advisors. Papers are judged for the scope of problem, degree of challenge, magnitude of student’s effort, hypothesis formulation and testing, and writing style. The committee, which included Richard Brill, Ryan Carnegie, Allison Colden, Jerome Maa, BK Song, and Kam Tang, evaluated 13 papers between the Ph.D. and Master’s categories. This year’s choice for the best paper by a Master’s student goes to Kristina Hill for “Phylogenics of Bonamia parasites based on small subunit and internal transcribed spacer region ribosomal DNA sequence data.” Her paper appeared in Diseases of Aquatic Organisms and includes co-authors Nancy Stokes, Kim Reece, Eugene Burreson, and Ryan Carnegie. Overcoming disease is one of the major challenges faced by the global aquaculture community. Protozoan parasites in the genus Bonamia are one of the major threats to oyster aquaculture, yet we have known little about the diversity and distribution of these pathogens. In this paper, Kristy used a combination of molecular and microscopic methods to analyze more than 1,500 oysters from 11 species in 21 locations on 5 continents to better characterize Bonamia diversity. Kristy’s work has led to improvements in aquaculture biosecurity management in the US and as far away as Australia, highlighting the important role VIMS plays in this arena. 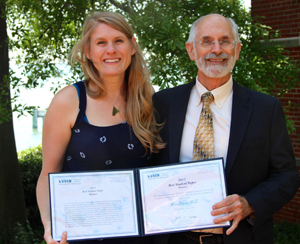 The most meritorious student author in the Ph.D. category is Mark Henderson for his paper “Detecting non-compliance in the summer flounder recreational fishery using a mark-recapture growth model.” This paper appeared in North American Journal of Fisheries Management and was co-authored by Mary Fabrizio. Fisheries management is as much about managing people as it is about managing fish. 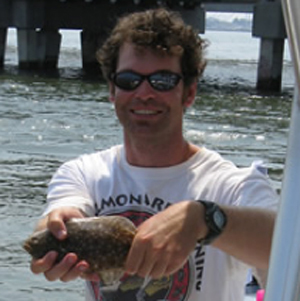 Using information from the Virginia Game Fish Tagging Program, Mark developed and applied a growth model to investigate noncompliance with size limits and harvest restrictions in the recreational fishery for summer flounder. His study provided important observations on the behavior of recreational anglers in response to changes in regulations and confirmed the belief among fishery managers that increasing the minimum size regulations in this fishery could lead to increased angler noncompliance.